First thing I realized is that there is a very strict order to everything and timing is very important. Microchipping must be done before vaccinations and only one year rabies vaccines are accepted coming into Europe. Tikka had a three year jab, but alas, had to get a one year before we left. Vaccines must be administered 30 days before travel. From the Canadian Food Inspection Agency (CFIA) website:’ according to EU regulations, a rabies vaccination is not considered valid unless the animal was properly identified at the time it was vaccinated. The microchip or tattoo number must also appear on the rabies vaccination certificate in order for it to be considered valid. A certified vet must verify that the vaccination was administered. Microchips can be different types, however a ISO standard 11784 rated microchip is preferred as the standard for entry to Europe, otherwise if it is any other type you have to bring your own scanner with you. They sell them here. For travelling from Canada to the EU, the paperwork needs to be downloaded from the CFIA and there is lots of information to get you filling things out like a pro. Here is the link for the CFIA – Non Commercial export of animals. After looking up the country that you LAND in (not your final destination) I downloaded it and printed off two copies. I had an extra in case of any mess ups at the vet. This has to happen within 10 days of travel to the EU. Take the forms plus a printout of the instructions to your appointment, making sure they know why you are there. You need to do a health examination and tell them you need this paperwork filled out. And here is a fun fact. It HAS to be filled out in BLUE ink…no exceptions! We also got an International Health Certificate from the vet for the airline in case someone asked to see it. Everything at Tikka’s appt went well, we were in an out in 30 minutes with a vet stamp in the first space of three (vet, CFIA, customs at destination) on the document and were ready for the next step…the ruler! Are you the owner of the dog travelling with you? Do you have more that 5 dogs with you? After all that was done it was time to take the papers to the CFIA for a pre arranged appointment – List of offices. I took the papers and $20 and was there only 15 minutes while they put their stamp on the back page, in the second spot. Once back at my office, I made two copies of all the stamped papers so that I had a spare as well as all her vaccination records, tattoo and microchip certificates. Bring everything with you in duplicate – you will save time if anyone needs a copy of something. And the CIFA have this handy checklist you can reference. Was that really all of it? … Do we have everything done? … Is it all correct?… Did I forget anything? I guess we’ll find out 10 hours after our flight and we have a customs officer staring at us. The big test finally arrived. After months of planning, Tikka, myself and my husband were finally airborne and we were cautiously optimistic about what the EU custom officer had in store for us. We eagerly followed the signs to baggage claim at the Munich airport and before long passport control was in front of us becokoning us forward. And what do you think happened after all the previous months of organizing? Not a DAMN thing!!! They couldn’t have cared less and waved us on without a blink when we told them we had a dog. My husband and I discussed how surprising that was and figured that customs must be different than passport control and we’d have to show the paperwork after we got our bags. That time came in 20 minutes and there was no indication that we even had to declare having a dog with us. We did what we thought was best and went through the red customs channel in to declare her anyways. A very friendlly customs officer took Tikka’s documents and went away to the back of his office. Ah ha! This will be when we get that last stamp on her papers, giving us closure for a job well done. He returned 2 minutes later and said ‘Ok, enjoy your holiday’. We flipped to the last page and that third space still sat empty – not even a whiff of a stamp. We took the hint…move on and have a great holiday, which is just what we’ll do. Of course for future travel, we will still follow all procedures as you never know when you’ll have to have everything ready to present to customs with a trigger happy stamp. Read about the first leg of our road trip in Germany and Austria. When a family birthday celebration was recently organized for Sin City, I was curious if bringing Tikka on the trip was viable, for us and for her. I had never brought a dog to Vegas and you don’t see too many around when you are in the hotels or out on the strip. Where would we stay…what about the heat…? After an uneventful Air Canada flight we arrived on time at McLaren airport, ready for our first dog adventure in Vegas. Tikka and I stepped out of the airport and were overcome by a thick wall of heat. It was hot. Very hot. Burning hot. Did I mention it was hot? If it was a shock to my system, I’m sure it was to her as well, so we promptly got in the taxi line and luckily was in air conditioning within 5 minutes. This is something to be really conscious of, travelling to the desert with a dog and dealing with the soaring heat. During our trip we stayed in the air con whenever we could while waiting on taxis etc. Throwing the ball around for some decent exercise was reserved for early am and I checked the pavement with my hand before walking her onto it so that we could avoid any burnt pads. Check in was a breeze. The crate was on our file so the front desk called to have it delivered to the room right away. Reception popped into the back and came back with a bag of goodies, something they provide for their doggy guests. A quick trip up the elevator to the room and we checked out our swag: A Vdara blanket to keep, that folds up with a handle, a biscuit and info about their dog program. We laid out the blanket on the sofa, knowing full well Tikka would be up there any chance she got. The crate arrived shortly after we settled in and with such a big room it was easy to have it out of the way. It was a proper heavy crate, and they provided another blanket to put in the bottom without asking. Vdara’s policy is dogs must be crated if no one is in the room, so either bring your own or let them know when you book that you need one. If crating is a no go for your dog, then they will organize a pet sitter to come and hang out in your room while you gamble or catch a show. Rooms are gorgeous – modern, large and a complete kitchenette with small fridge and hot plate and small dining table, separated from the bed and sitting area. Good open space to brush up on some tricks and bounce the ball around or have a decent game of tug o’ war. The lobby has a small market, so you can fill up your fridge with people snacks or maybe a cheesey treat for tricks. Tikka is on a raw diet so the fridge is super handy to keep ground turkey fresh from a trip to the grocery store, but we indulged on this trip and ordered from the in-suite dog menu. 3 different dishes are on offer and we settled on a rice and chicken dish. Room service was quick and Tikka’s breakfast arrived with my pastry selection (* word of caution – Tikka’s breakfast arrived heated up and was incredibly hot, check the temperature before your dog dives in). Even though I ordered a small portion, it was huge (yep, Vegas), so I saved half for the next day and popped it that handy fridge. A tip for the peoples… Skip the pastries from the room delivery menu and pop over to Aria (3 min connected walk) and indulge in the baked goods and premium teas from Jean Philippe Patisserie. Croissants are flaky and buttery and yum. Nutella brioche? Yes please! Now here is where Vdara has an edge on other dog friendly hotels in Vegas. Only steps from the lobby is a fenced in dog park! When nature calls and it’s time to pee, no problem. Zip down in the elevator and relief is just a few minutes from your room. There is no long walk to get outside, as unlike most of the hotels on the strip, Vdara has no casino. Calm down gamblers, Aria is only a minute away and Bellagio is connected by a 5 min walkway. The dog park is small, but it’s fully fenced and nicely maintained with two grassy areas that are actually green in the middle of summer. There is a water fountain for people and dogs, as well as poop bags and a garbage can. So this is why this next comment just fries my ham. It’s a small park with a bench. It has bags. It has a garbage can. But there was still a mess left behind! Who does that?!!??!! People, please pick up after your dog…Indeed the hotel is catering to our every need, so it’s only respectful to pick up the poop and not leave it for the staff. We all want more dog friendly hotels, so let’s work together on this and be the type of pet owner that establishments want to provide for. Rant over. One comment for the hotel is it would be fabulous to provide some mid day shade. The fence is surrounded by beautiful landscaping and lots of trees, so morning and late afternoon provides a lot of shade with the longer shadows, but come 1pm it’s all gone. I planned around this, which was pretty easy to do, but would be a nice bonus to have a tree in the middle or shade over the bench. When we did venture out for a longer romp we headed over to Charles Frias Dog Park. No more than 5 min in a taxi and the driver let Tikka jump right in. Fabulous park that has three enclosed areas and lots of room for chasing and running. Tikka met some locals as did I, and we got tips on the best steak in town and where to go for some great dog hikes in the cooler months. No doubt we’ll be bringing Tikka to Las Vegas on future trips, a paws up fron VanDoggo! Nothing better than a wagging tail in your hotel room when you come back with your winnings. And nothing better than a wagging tail when you lost your shirt! There are a wealth of photography tutorials online and they have been a fantastic guide as after many years break I have gotten back into photography, but there are also invaluable lessons that my hairy 15 pound sidekick and photography teacher, Tikka, has been teaching me: Patience and Adaptability. My photography teacher by my side. Working with a dog as your subject means that you are executing your photos as a team and it’s all at the pace and desires of the dog you are with. You may have taken them to the location that you want to photograph them, but that’s where it all turns over to them. Are you looking for a quiet portrait and they are chasing squirrels around a tree, or are you looking for an action shot and they have fallen asleep waiting for you to get your act together? This plays into the second lesson of being able to adapt, but with patience you can get the photos you hoped to take that day. Waiting patiently in the early morning forest light. If your dog has the zoomies then take a break and have a good play session to burn off some of that energy. This also helps to perk them up – bring out the best toys and squeakers and get them interested after you have your camera settings ready to go. They key is not to rush the process, be patient and look for what you can do to help get in the ‘zone ‘ of the photograph. Tikka waiting in her dog bed while I play with studio lighting for the first time. Once you are in the ‘zone’, wait it out for the photo you are searching for. Your dog might be distracted by the new surroundings, but give them a moment to settle and keep shooting and that pose you’ve been looking for will suddenly arrive and you’ll have it. It may come with the first press of your finger to shutter, but the best part of having a digital camera is that it’s no expense to take lots of shots. This was huge for me after so many early years using film and with my new camera I was really precious with the amount of shots I took. Tikka taught me to keep shooting and try lots of settings and it won’t cost her any dog biscuits in the fails. Tikka at Halloween dressed as Snoopy . Learning patience also goes two ways – building a solid ‘wait’ command is a huge help in the studio or on location, slowing the dog down and getting their attention on you for their next command. I’ve learnt not to overdo it – always stop and change spots or give the dog a break before they do and then they will always be a willing model. 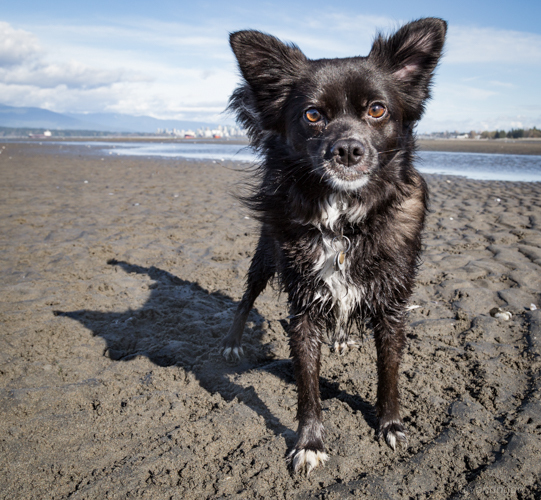 Tikka has taught me how to adapt from human height to dog height and how this new perspective opens up a whole new quality of photos… and dog height is basically lying in the sand and mud as she is only 15 inches at the shoulder. Getting down to her eye line makes fantastic shots and people are always surprised at how small she is when they meet her in person. Laying in the sand to get personal with Tikka. It also means adapting quickly to changing exposures from walking through filtered light in the forest to an open area in blinding sunlight along the river to set up a photo. Changing shutter speeds, aperture and ISO to get the right combo keeps you in your toes as you walk along with your dog looking for great places to stop. And also adapting quickly to changing cameras – depending on what Tikka and the surroundings are calling for I regularly pull out my iPhone as it may be all I bring with me. Adapting to our grey cat, Perry, photobombing our shoot. If you set out in the morning with the intention of getting the exact perfect shot in your brain and not leaving until you get it, well you know how that’s going to end. A frustrating day for both you and your dog. Instead, setting out with a goal in mind and then being able to adapt when the conditions aren’t right or the dog is more interested in joggers etc., you won’t come home pulling out your hair or driving your dog nuts in the process. That might mean you had to adapt yourself right into putting the lens cap back on and having a good walk instead. It’s never a loss as I’ll turn those days into location scouting. Always up for a game of fetch and having me practice ‘sports’ photography. My continuing lesson in adaptability is getting out with some other dogs! I’ve compensated for having a black dog in front of my lens so there will be lots to learn when a white Samoyed fills the frame. So thank you Tikka for teaching me these wonderful tools and being patient with me while I adapt to being more comfortable with the camera.